Currently the lightest and slimmest digital SLR available, the Olympus E-410 might bring a nostalgic tear to the eye of old school Olympus owners, with the camera’s traditional lines evoking memories of the legendary OM series of film cameras. Aimed at users looking to move up from point and shoot cameras, the Olympus comes with a raft of familiar scene modes and easy-to-navigate menus to guide hesitant newbies, but still packs enough controls to give compulsive tweakers full manual control. Made from a lightweight but tough plastic, the E-410 serves up a clean and concise layout with good ergonomics that feel great in the hand. Unlike the bulky hand grips seen on most digital SLRs, the front profile of the Olympus’s slim body is almost completely flat, with just a slight rubberised ‘bump’ to grip onto. You might think that this would make it hard to keep a hold of the thing, but we actually found the E-410 very comfortable in use, and it made a pleasant change not to have to lug about a heavy beast of a camera. 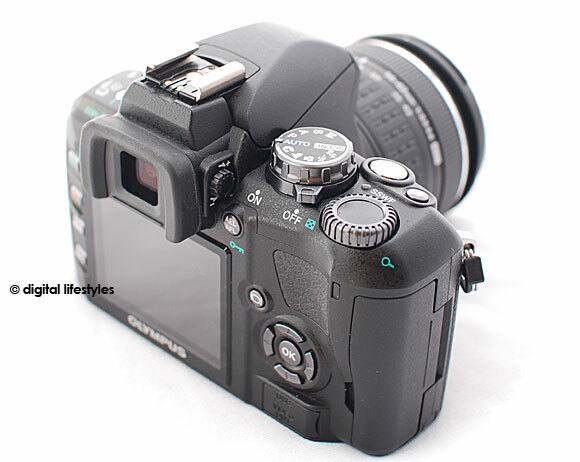 The E-410s controls are logically laid out, with the shutter release falling nicely under your index finger. 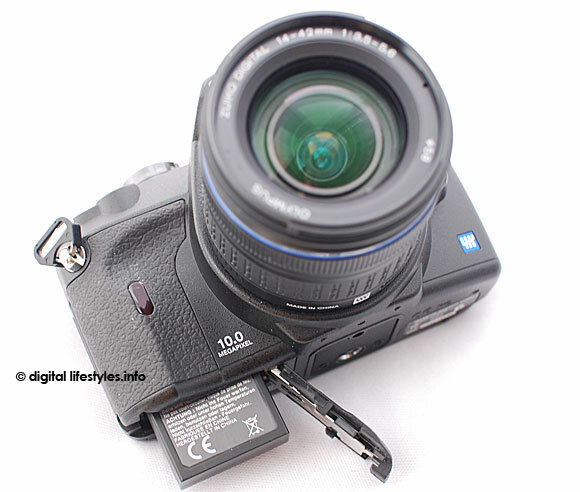 Behind the shutter release is a large mode dial which sits on top of the camera’s on/off switch. The mode dial offers settings for fully automatic, programmed auto, aperture priority, shutter priority and manual modes, followed by five of the more common scene modes with a general setting for accessing the additional fifteen built-in scene modes via the LCD screen. Each of these modes appears on the LCD screen with an image sample and short description, which we thought was a nice, user friendly touch. To the right of the shutter release is an exposure compensation button, with a large flat control dial for making adjustments, like altering the f value while in aperture priority mode or changing exposure compensation levels. On the left hand side of the camera are two more buttons – one controlling flash up/mode and the other for self-timer/drive mode, with adjustments and status displayed onscreen. 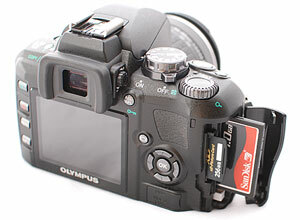 Being a member of the ‘Four Thirds’ digital SLR family, the camera’s lens mount/electronics system complies to the Four Thirds System standard, so it’ll work with third party 4/3 lenses – but not, sadly, old Olympus film camera lenses (third-party adapters are available but these offering hugely reduced functionality). Lurking inside the lens mount is Olympus’s “Supersonic Wave Filter” which dislodges any dust by vibrating a thin filter in front of the sensor at very high frequency. Bits of gunge and thrack shaken off then drop on to a bit of sticky tape, out of harm’s way. The process is automatic at start-up/shut-down and can’t be disabled, but thankfully is fairly speedy. Anyone’s who spent hours delicately trying to blast lurking bits of dust off a dSLR’s tiny sensor will probably find the cleaning worth the wait. Look out for Part Two of the review tomorrow. Next Next post: Win Tickets For A Private Screening Of Friday’s England Rugby Match – On Top of BT Tower!